A peculiar day with the break being given not just a gap, but a chasm. They finished half an hour before the peloton – although none among them had been within half an hour of the lead, so it was irrelevant in the grander scheme of things. Young Italian rider Valerio Conti was by far the strongest and opened up a gap that would never be closed with 19km to go. Conti is another name to watch for the future, rather than one with a long back story. The highlight of the day was watching the peloton roll over the line with a complete lack of intent. The ambience couldn’t have been less competitive and yet Alejandro Valverde ensured he was the first of them, securing that oh-so-ought-after 13th place on the stage. In truth, everyone was saving their strength for this – a jaunt into France for some long, long climbs. I’m not sure about the route in all honesty. It’ll be hugely influential in deciding the race, but it seems much more like something from the Tour de France than the Vuelta a Espana – and not just because of the location. I like the Vuelta’s short-sharp summit finishes and this seems like something from another world. Or from another month, at any rate. 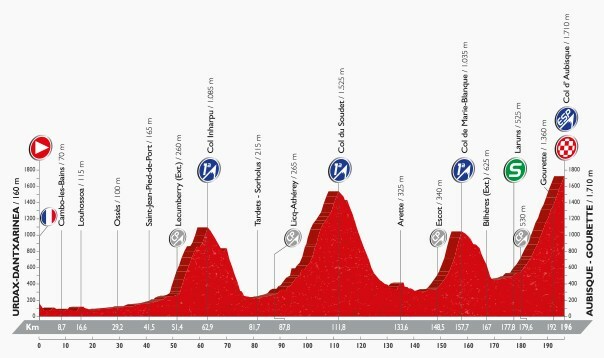 The riders will tackle three first category climbs and then a ‘beyond categorisation’ climb to finish. The easiest one is 24km at 5.2%. The final one is 16.5km at 7.1%. Today’s stage term is ‘limestone pavement’ – rocky terrain featuring numerous holes, grooves and sharp edges, which is produced through erosion and dissolution by water.